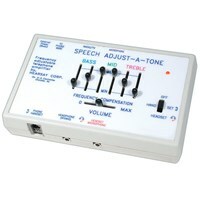 The HGA-TP is the basic "Speech Adjust-A-Tone" model, offering the ability to attach to both telephone and television. 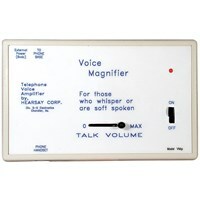 Use it for clearer telephone conversations or when listening to the TV, radio, tape recorder or a computer sound card. 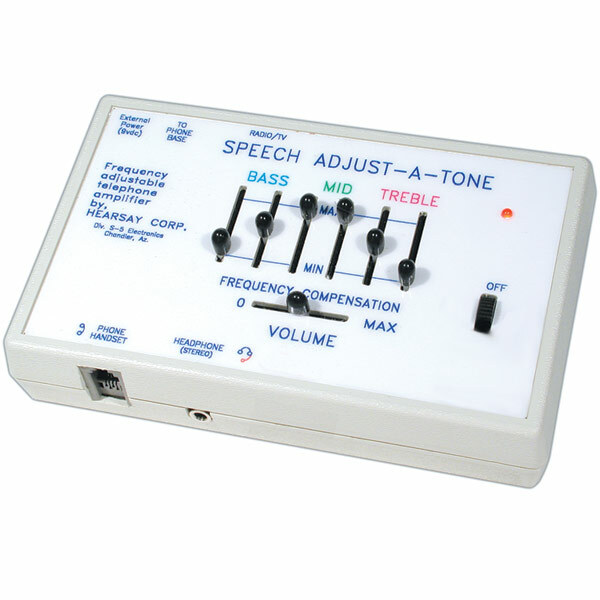 The Speech Adjust-A-Tone is more than amplification. Six adjustable frequency ranges can adapt to each person's particular hearing loss and thus aid in speech discrimination as well as amplification. While listening to television, radio, tape recorder or computer sound card, the hearing impaired user wears a headset (not included) and can adjust the volume control and frequency controls for optimum clarity. A neckloop or bone conducting transducer (neither included) can also be used. Others in the room are not disturbed. It can be used with the old style carbon microphone or the newer electret microphone equipped phone sets. Most standard headphones with miniature stereo phone plugs will work with this unit. Headphones need not be worn when the device is used with the telephone, but may be beneficial in some cases. The HGA-TP includes a Telephone Receiver Cord, a 9 Volt Battery and a 1 Year Repair or Replace Warranty.